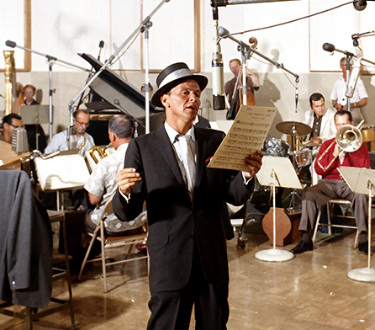 Since way back in January, we here at TCOTS have been celebrating Frank Sinatra’s 100th Birthday and, man, it’s been a swingin’ affair so far. We started by ticking off the 100 Best Performances of The Chairman Of The Board on CD and digital download, and now we’re ready for another supersonic flight where the air is so rarefied: counting down the Top Ten Best Albums of Mr. Sinatra, because, above everything else, ol’ Francis Albert was about da albums for a good part of his career [we’ll be featuring one album per week and this will take us right-up to the big day: 12 December]. Best Mastering* on CD/Digital Download: 2013 Mobile Fidelity SACD. A new mastering of this in Mono is long overdue. It’s so dark and brooding it actually changes the weather outside when I play it. From blue skies and sunshine it changes to cold, windy, overcast and wet as soon as I put this LP on! Indeed. No One Cares is, perhaps, the bleakest record ever made…and it’s also one of the most wonderful, penetrating, and beautiful works on the devastation of Love lost forever. Consider it a funeral mass. Frank pours everything he has into this set [listen to the way he sings ‘You know I’ll love you’ on I Don’t Stand a Ghost of a Chance with You — that’s perfect Heartbreak you’re hearing]. 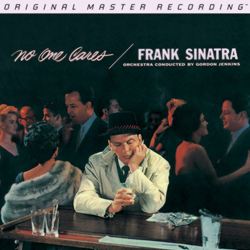 Originally, there were supposed to be twelve tracks, but the limitations of the technology used to cut albums in Stereo forced Sinatra to leave the performance of The One I Love Belongs To Somebody Else off the release [two good masterings of this song can be found on the 3-CD The Capital Years and as a bonus track on the 1991 Larry Walsh engineered CD]. Put this tune in place of the Stormy Weather misfire [the only track that doesn’t work here] and I think you’ll be very satisfied. See you next Weekend as we head-off again to Bobsville and pick ourselves the Number One Sinatra Album…and tell us your favorite albums in the Comments, Clyde. I must confess that this is one of my least-liked Sinatra albums, and reading your post I wonder if that isn’t at least in part due to that very rare Sinatra misstep, viz., this interpretation of Stormy Weather. I particularly dislike the first few bars with a venom I can’t fully explain — or even understand — and that dislike seem to colour my feelings toward virtually all the songs thereafter. Possibly because I recently had a long discussion with dr woo on whether Sinatra or Elvis sings My Way better — his opinion on the matter is entirely bizarre, by the way — I also think that Sinatra ventures very close to ‘Elvis vibrato’ in too many an occasion on this album, and though I don’t mind Elvis being Elvis I do mind the half-expectation of Sinatra breaking out in In the Ghetto (the live version with the over-the-top background singer in which Elvis giggles himself silly). For an album which can ‘change the weather’ (which is a very nice phrase), give me Only the Lonely any day!